Version 9.0 of the Cisco ASA software has now been released. Here are some of the major features in the new release. to find some more information on this feature. I’m interested to hear from you what you want to see from this blog in the future. As I have passed the CCIE lab it won’t be only CCIE related things. Would you like to see some troubleshooting labs? Technical articles? Posts on other certifications that I pursue? I’m probably doing the CCDP in the future but I don’t expect that to generate a lot of posts. Looking forward to hear from you. So by now you know that I passed my lab in Brussels yesterday. Here is my story. in the evening if your body is tired. I did not sleep that great however. you don’t sleep that well. Don’t make too much of a deal of it. that look easier. These are usually the ones that contain only a few devices. creatively and you can find a solution to what seemed impossible earlier. For the TS it is very important to have a good understanding of the protocols. and don’t skip reading the guidelines in the beginning to save time! It was now time for the configuration. I ate a banana to refuel some energy. I moved along compared to my earlier attempts, don’t blindly trust your config! make sure you have done everything that you possibly can. take anything for granted but then I clicked it and there it was! My number! studies only now I can explore more interesting technologies and write about them. Thanks for following on this great journey! dropped it is because there were not enough buffers to store it. to us so we have to use the percentages. Of the buffers we assign to a queue we can make the buffers reserved. that go to threshold3 400% of the buffers can be used which means 200 buffers. if the other queues are not using them. platform port-asic stats enqueue command. threshold1, weight 1 is threshold2 and weight 3 is the maximum threshold. show platform port-asic stats drop command. The queues are displayed in the same way here where queue 0 = queue 1.
traffic like IPTV traffic or such that is dropping in a certain queue. hope that you know have a better understanding how the egress queueing works. want to do some learning for myself as well. When we are talking about NAT we have some terminology that is commonly used. we are referencing when talking about the IP address. The terminology is this. Inside global address – This is the address as seen by other hosts on the Internet. This is the address after translation has occurred. side is running public IP addresses on the inside (a valid design). same as the inside local depending on if NAT is used or not. When using NAT we need to define inside and outside interfaces (except if NVI is used). outside interface or vice versa. how the translation table looks like. We now see that the source is translated to 193.10.0.254. The translation table is below. When we are doing static NAT translations we can also match on an access-list. 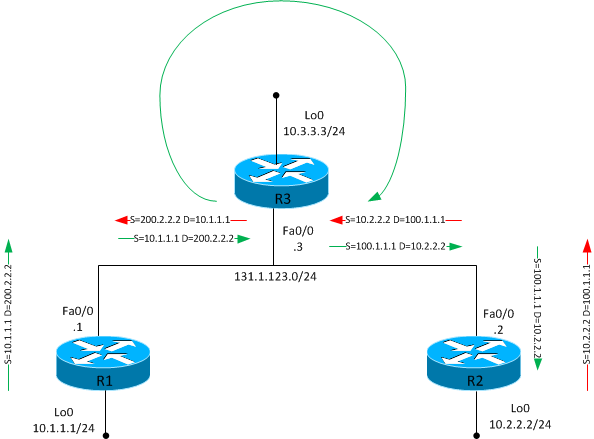 We will debug on the destination to see which address the ICMP packet coming in has. Once again we look at the translation table. of a DNS failure. Use the following syntax. Now when we ping we should see the source getting translated to 193.10.0.11.
a NAT pool matching this and then we enable NAT for the 192.168.1.11 address. We do a ping to look at the translation. 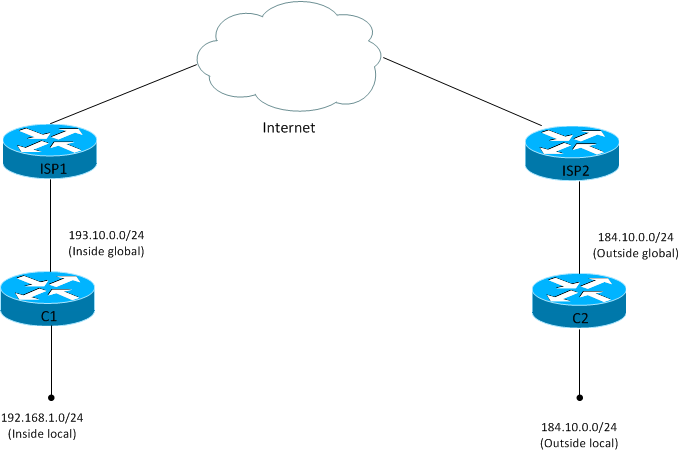 we can do NAT for networks that are not configured on the router. This is the translation table. if we want to. We do that like this. Now when we ping the IP should get translated to 194.10.0.11. Which it did. So even with pools we can match the host part of the address. the pool if we want to do Port Address Translation (PAT). Now to verify the configuration, first we send telnet to 184.10.0.4. Now we send to port 80 instead. inside interfaces we could even match on those. inside local addresses will be mapped to one inside global address. it by sending TCP packets. 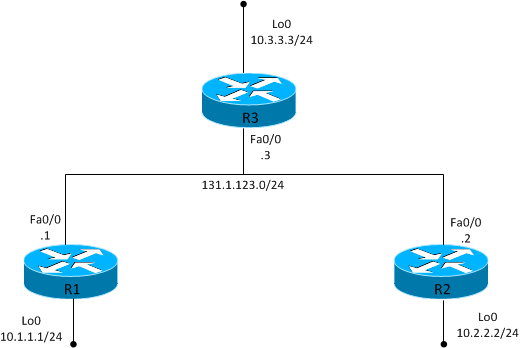 Just sending ICMP will not trigger the NAT translation. on the outside. And this is the translation table. common scenario but the idea is this. Look at the topology below. one interface as inside and the other as outside. How can we solve this? be translated to 200.2.2.2. We start by setting up the policy routing. We create an access-list matching traffic from 10.1.1.1 to 200.2.2.2.
loopback0. The loopback interface will be the NAT inside interface. lets think about the traffic flow. is translated to 10.2.2.2, then the packet is sent out Fa0/0. Take a look at the translation table. Finally here is a drawing that is describing the traffic flow. memory or you will see some strange things happening like sh run not working.